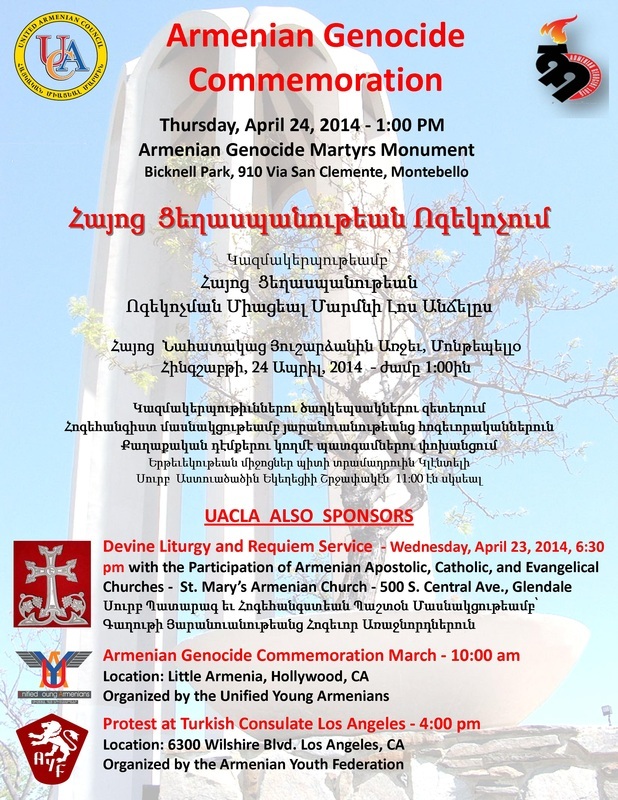 LOS ANGELES—The Armenian community of Greater Los Angeles will commemorate the 99th anniversary of the Armenian Genocide on Thursday, April 24, at the Armenian Genocide Monument at Bicknell Park, 910 Via San Clemente, Montebello, CA 90640. The event will start at 1 pm with the placement of wreaths at the Monument by participating organizations, followed by a religious service with the participation of representatives of all religious denominations of the Armenian community and a full program that includes remarks and messages from invited political dignitaries, concluding at 3 pm. The Los Angeles United Armenian Council for the Commemoration of the Armenian Genocide, which consists of more than 50 Armenian religious, political, compatriotic, and other community organizations, is the organizer of this commemorative event. For a complete list of the member organizations, please visit www.uacla.com. The United Armenian Council for the Commemoration of the Armenian Genocide invites all community members to attend the commemorative event at the Monument. The United Council also calls upon everyone to take part in great numbers in all other commemorative events on the anniversary of the Armenian Genocide.